Secretariat DVD Review. The film sees Diane Lane starring as the thoroughbred’s owner, John Malkovich as its trainer and the largely unknown Otto Thorwarth as jockey John Turcotte (I’m not sure who played the horse). Having never been overly fond of horses or the racing thereof, unfamiliar with cinematic triumphs such as Seabiscuit and only vaguely proud of Phar Lap in the most generically patriotic fashion possible (wasn’t he from New Zealand anyway?) I wasn’t exactly chomping at the bit to see Secretariat, the new Disney flick about a 1970s racehorse and the personalities involved in ensuring he ran his fastest. 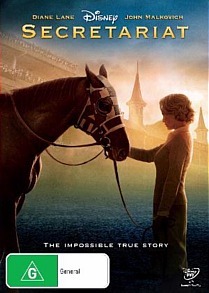 The film sees Diane Lane starring as the thoroughbred’s owner, John Malkovich as its trainer and the largely unknown Otto Thorwarth as jockey John Turcotte (I’m not sure who played the horse). Through their collective efforts and plenty of blood, sweat and tears the chestnut quadruped eventually comes to win racing’s coveted Triple Crown, consecutive first placings in the Kentucky Derby, Belmont Stakes and Preakness Stakes. I must say that I found my initial scepticism not entirely unjustified. Replete with rousing score, dramatic use of chromatics and slow motion sequences and all the shameless Disney heartstring tuggery one would expect, Secretariat is presumably all very moving to American audiences, but struck this antipodean reviewer as the merest of exercises in bald melodrama. The performances are sound and, in fairness, the film has received largely positive reviews from a host of (largely American) critics. I for one found its appeal rather limited however. Sorry Disney! The letterboxed widescreen transfer is surprisingly soft and the indoor sequences practically steeped in shadow - not sure if this was a deliberate attempt to convey mood but it comes across as strangely and consistently dark. The soundtrack is the usual cloying combination of mushy orchestral accompaniment and jaunty violins, though is reasonably clear in 5.1. Spanish audio is provided also.